Whitney Stewart’s latest work, ‘A Catfish Tale,’ is an homage to both the Brothers Grimm fable, ‘The Fisherman and His Wife,’ as well as the work of the late Cajun storyteller, Coleen Salley. Reading Whitney Stewart’s latest illustrated children’s book, “A Catfish Tale,” echoes of an age-old fairy tale immediately spring to life. 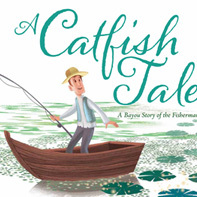 A humble fisherman catches, and then tosses back, a fish who claims to have magical powers. Scolded by his greedy wife, he keeps coming back to fish to grant one seemingly impossible wish after another. And then they go too far, and the fish takes away everything they’ve been granted, and they’re returned to their humble life. “The Fisherman and His Wife” by the Brothers Grimm, right? Totally rings a bell. But for Stewart, a native of Massachusetts who has made New Orleans a second home, there’s more to the story. Having grown up on the Brothers Grimm as a child and married to a German native, evoking the spirit of Grimm made sense as she work-shopped her latest project at her writer’s club. But when she told her fellow writers she wanted to dedicate the book to the late Cajun storyteller, Coleen Salley — who had become something of a mentor to her in the 1990s — something became obvious to others. What: Whitney Stewart reads from and signs “A Catfish Tale,” her homage to both the Brothers Grimm and the late Cajun storyteller Coleen Salley. Where: 3721 Veterans Memorial Blvd., Metairie. When: Sat. (Dec. 6), 3 p.m.
More info: Call the store at 504.455.4929. Lovingly so. In “A Catfish Tale,” you can hear both the cautionary tone of the Brothers Grimm and the lyrical splendor of Salley’s work in such classics as the “Epossumondas” series. Like many aspiring Louisiana children’s authors, Stewart sought out Salley while working on a story for Highlights for Children magazine. They became friends. The story never materialized, but Stewart’s love of Salley and her storytelling style did in its place. They bonded over the fact that Salley had once lived in Germany and also was a fan of the Brothers Grimm stories. But really, Stewart could just listen to Salley talk all day. And so Stewart crafted the story about Jacques, a poor Cajun fisherman on the bayou who catches a catfish one day. The fish convinces the man to let him go back into the water because special powers made the fish a bad meal. Upon hearing this, Jolie, Jacques’ wife — a pretty singer with aspirations of grandeur — goads Jacques into repeated visits back to the catfish for increasingly bigger wish fulfillment. As a humorous aside, Stewart recalled running into a “junior editor” who was copy-editing the book and wanted to remove the phrase “touloulou,” not realizing it was Cajun French for fiddler crab. Stewart politely and convincingly insisted it remain. The ending, straight out of Grimm, offers a lesson in humility. The key for Stewart was capturing the Cajun voice of the story as much as the words. She’d picked up that voice before Salley had become a published author in the 2000s. When they met in the early 1990s, Salley had become a legend in the French Quarter and reigned as the queen of her own Mardi Gras walking parade while becoming a fixture as a storyteller at New Orleans Jazz Fest’s Kids Tent. She died in 2008, and was honored with a jazz funeral. Storytellers, including Stewart, were invited to provide a memorial at the following Jazz Fest. “I could hear her reading this story aloud,” Stewart said of her work. “I had to put in more of that vocal burst that she had into it. Fortunately I had a lot of people encouraging me to play around with it a lot more, and to get more of that musicality into it.